A lasagna without tomato sauce? Yes, they exist...and this recipe is an amazing example of just how delicious a twist on the classic can be. And for a lasagna, this one is actually pretty simple to make. The bechamel sauce used is what's the most time-consuming and strenuous to actually cook: cook flour and milk until thickened, then add a prepared pesto, Parmesan cheese, and salt and pepper. The sauce requires constant whisking to prevent sticking or burning, but for some reason, mine took FOREVER to even reach a boil. So I played with the temperature a bit toward the end to speed up the cooking, but it never truly thickened like I thought it would (then again, I was using lowfat milk). Once the sauce is done, saute chopped asparagus with a little garlic...and there's your veggie filling. 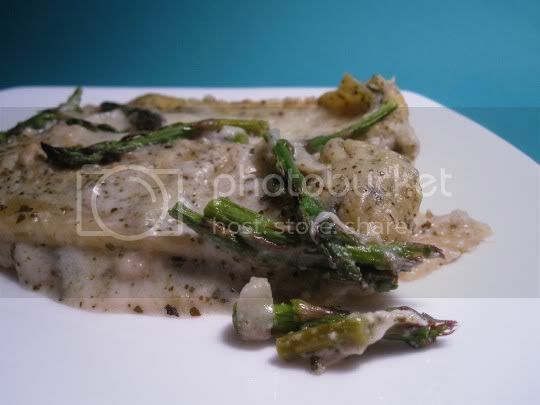 One layer of this lasagna consists of no-bake noodles (a godsend), the sauteed asparagus, the bechamel-pesto sauce, and grated Fontina...and this is only repeated twice. So simple! Bake uncovered for about 40 minutes, and it's ready to go! The lasagna is so yummy: creamy, rich (without being overwhelming), cheesey, and salty. A little too salty actually, so you may want to reduce the salt content in the sauce. The asparagus has that fresh woodsy taste, and I think another veggie like mushrooms would have been a wonderful addition too. This is very thin compared to typical lasagna, so you might want to up the serving size. The recipe suggests 10 servings, but you probably will want to increase that to 8 (and hey, 8 squares is easier to eyeball and cut than 10!). Even a meat-eater gave this lasagna praise...so that's saying a lot! Make again? Yes. I love asparagus, and it's such a unique recipe! Vegan variation: Substitute soy milk, soy cheeses, and a vegan-based pesto.